The Hotel Logis is located in a former hunting lodge in Birkenwald, 35 km from Strasbourg. It combines en suite accommodation with spa facilities including a hammam, sauna and indoor swimming pool. Each room has its own private bathroom, a flat screen TV and a complimentary bathrobe. Free Wi-Fi is available throughout the Logis Hotel Spa and Restaurant Au Chasseur. The comprehensive spa offers free access to the hot tub, a hammam and massages are available upon request at an extra cost. 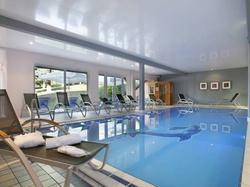 The indoor swimming pool is open all year and overlooks a garden with outdoor seating. There is a children's playground in the hotel garden. The hotel restaurant serves gourmet French cuisine and features many wines from the surrounding Alsace region. A generous buffet breakfast is available daily. Popular activities in the region include hiking, cycling and wine tasting. The hotel is near the historic Maginot Line and 70 km from the Sainte-Croix Animal Park. Please note that clients must pay a city tax from 01 May to 30 September. This spacious room includes a flat-screen TV, a desk and a private bathroom. This suite includes a flat-screen TV, a desk and a private bathroom. This spacious family room has two rooms with a seating area and balcony. This room includes a flat-screen TV, a desk and a private bathroom.